PLEASE NOTE: Fixing any surface mounted / fixed item into Tarmac is never as good as into Concrete. It is important to not drill the holes to wide as in warm weather tarmac becomes pliable and fixings will naturally loosen. 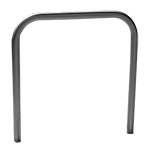 Sheffield type bike stand but the Bilton is useful for smaller bikes or to provide additional secure locking points for cycle frames or wheels. Environmentally friendly forms of transportation such as bicycles are being increasingly used to get to and from work, however in order for people to use bicycles it is essential they have somewhere secure to safely store their bicycles. The Bilton stands, complete with an additional lower round bar for added security, would provide a safe location for staff & visitors to lock up their bicycles. These 48mm round cycle stands are commonly used in public areas / spaces as well as many commercial parking areas. 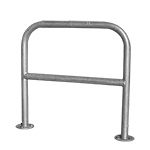 Similarly to the Sheffield stands these Bilton bicycle stands come with a choice of a galvanised, galvanised black powder coated or 304 grade stainless steel finish for both the surface mounted and concrete in versions. Both the concrete in and surface mounted stands are 750mm high (above ground) & each stand is suitable for the storage of up to two bikes (one each side). It is recommended that each stand is placed approximately 800mm apart and 450mm from any wall or obstruction. 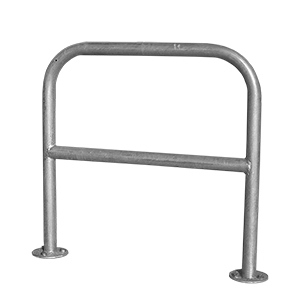 The Bilton stands come with an additional lower round bar part of the way down to enabling smaller bikes to be chained up, the lower bar also provides additional securing points for wheel or bike frames.